Mai Mihara of Japan performs her long program at the 2017 Four Continents Figure Skating Championships. A year ago, Japan’s Mai Mihara didn’t even know if she was ever going to compete again, and now she topped the Ladies podium at the 2017 ISU Four Continents Figure Skating Championships in Gangneung, Korea. Gabrielle Daleman of Canada earned the silver medal and USA’s Mirai Nagasu took bronze. All three ladies produced personal best scores in the free skating. Mihara was an up and coming junior skater last season who made it to the Junior Final in December 2015. However, following this event, she was diagnosed with arthritis. 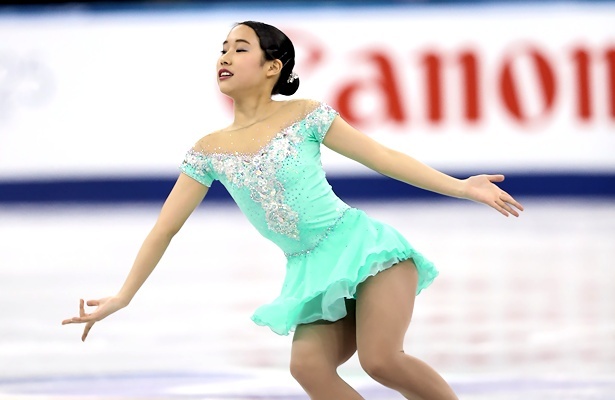 “A year ago, at this time I couldn’t even stand up and walk, and to be able to compete at the Four Continents and to be selected for the World team is something just incredible,” the 16-year-old said following her clean short program that put her into fourth place. She overcame the painful illness and came back stronger than ever, giving solid performances throughout the season. The “Cinderella” free was no exception. Once more, the petite Japanese put out a flawless program with seven triples to score 134.34 points and 200.85 points overall. And so, her fairy tale story became true: Like “Cinderella,” she rose from the ashes to triumph. Daleman won the short program. The Canadian has had good short programs in the past, however, then struggled in the free. This time she held it together, although she singled a loop and almost fell on a double Axel. With 196.91 points, she held on to the podium and finished second, her first medal in an ISU Championship. Nagasu has had many ups and downs in her career as well. This year again, she narrowly missed to qualifying for the World team and got Four Continents as a “consolation prize” when Ashley Wagner withdrew. Like last year, the 23-year-old made the best out of it. A botched triple loop left Nagasu in fifth place after the short, but then she rallied back in the free, landing seven clean triples. Her score of 194.95 points lifted her onto the podium. Following her good showing at the Grand Prix, Kaetlyn Osmond was considered the favorite for this event. The Canadian champion ranked second in the short despite a fall on the double Axel. She started well into the free with a triple flip-triple toe and a double Axel-triple toe, but after she crashed badly on a triple Lutz, the program went downhill. Osmond had two more big falls and popped an Axel to drop to fourth. Dabin Choi of South Korea came out with two solid performances in front of her home crowd to finish fifth. She stumbled on her opening triple Lutz, but did not let that affect her too much. USA’s Mariah Bell made several errors on her jumps and came in sixth in what was her ISU Championship debut. Kazakhstan’s Elizabet Tursynbaeva stood in third following a strong short program, competing two days after her 17th birthday. However, in the free, the pressure seemed to get to her and she missed two jumps and singled the loop and faded to eighth place.